You’re in line at the airport check-in. There are still two couples, and a family ahead of you. You check your watch, “I’m going to be late” you think, stomping your foot. The gentleman at the counter finally calls you forward. You reach down for your passport. You’ve left it at home. Let’s face it- at some point, we have either lost, forgotten, or misplaced our passport; one of the most legitimate and official documents available to confirm our identity. 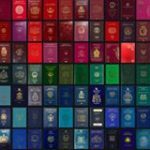 Passports have continuously evolved over the last 150 years; from a wax-sealed, one-page document, to a booklet embellished in holograms, data chips, and over 30 different security features to ensure its authenticity. The beauty of passports lies way beyond its shape and form, but the boundaries it opens quite literally, to each individual around the globe. With the new-age, paperless era however, we can assume its evolution has only just begun. Whether we’re searching for an efficient way to facilitate travel, or if governments are looking to expedite international trade, or prevent security threats, expanding the potential of our passport, is the first step. What are the benefits of a digitized “blockchain” system? If we’re looking for a solution for efficient travel: blockchain powered biometric passport is it! Yes, it’s a mouthful, but we’ll take it a step at a time. Essentially, all biometrics consist of, is a network of genetic information that is used to recognize your identity. Between the specificity of our fingerprints, to the unique characteristics on our face, there are many more valid, and accurate methods to authenticate ourselves using biometric information. The future however, is closer than we’d imagine. Did you know, that biometric passports, now known as the ePassport, is used in nearly 120 countries? Although ePassports have facilitated the travel process, it is still unclear whether it is enough to become utilized worldwide, as the sole source of accurate identification. The future of biometrics in passport security, extends to features such as facial recognition, and has already been implemented as an automated border control system called Vision-Box in Australian airports. Described as the “first contactless, on-the-move, face biometrics passenger identification gateway”, the future does look brighter…and paper-free! Over one billion people presently cross borders each year. In the wake of security threats and terrorist attacks, the urgency of establishing a protected technology to trace authenticity, has drastically increased. This is where there blockchain-based security system comes to play. This complex, but highly conserved technology stores data across a large and highly dispersed network. Unlike our current passports, which are susceptible to tampering and encryption, the blockchain-supported digital passport can assure an enhanced level of security thanks to its web of verification methods. Although blockchain technology is a new concept, the government of Dubai has already announced its collaboration with UK-based blockchain start-up ObectTech to develop digital passports, and with ongoing global discussions about encrypted validation systems, it is only a matter of time for the rest of the world to adopt such methods as well.